Heraclitean Fire » Quick bird round-up: duck special! Quick bird round-up: duck special! There was a shoveler at the local park the other day, which I think is probably the first I’ve seen there and a patch tick. ‘Patch tick’, for the non-birders among you, meaning a new addition for my patch list, i.e. the list of birds I’ve seen in my local patch — in my case a not very well-defined area consisting of anywhere within about half an hour’s walk of the front door. Not exactly prime birding territory, but it has a few suburban parks and a bit of woodland in it. Birders tend to keep a lot of lists: some of them lend themselves to being taken quite seriously, like a British list or a life list. Those lists are effectively a way of keeping score over a whole lifetime of birding, and those are the ones which attract the serious obsessives. But the great joy of the more casual lists — the garden list, the patch list, the London list, or whatever — is the way they can turn a rather ordinary bird into an exciting event. Like that shoveler: it’s an attractive but common and easily seen duck, and I’ve seen dozens of them this year already… but in the park it’s a patch tick. A tiny unexpected triumph in an otherwise mundane stroll around the park. I don’t actually keep a patch list written down anywhere. I’m not much of a record keeper when it comes to birding. My patch list, like my garden list and my London list, is a slightly fuzzy mental one. The only written lists I have are British and European; I don’t even have a proper life list, though I could more or less reconstruct one from various notebooks. Perhaps that would be a good project. Anyway, today I went to the London Wetland Centre and I added two birds to my British list and one to my life list. The one I’ve seen before is Scaup, a kind of duck which I saw in Japan many years ago; the new one is a streaky brown finch called Common/Mealy Redpoll. Which is actually a new species; not just new to me, new as in it isn’t in the field guide. Redpolls were split into two species, Lesser Redpoll and Common Redpoll, having previously been distinct subspecies. The Common Redpoll is what British birders used to call ‘Mealy Redpoll’, the paler, greyer, slightly larger redpolls from the continent which sometimes turn up here in winter among the more common Lesser Redpolls. As you can imagine, the differences are subtle, and I can’t say I felt immediately confident about the ID; but for once I had a good eye-level view of them instead of their undersides silhouetted against the sky, and in a flock of birds which were warm brown in tone there was one which was distinctly different looking, paler and greyer, and I thought, well, if I’m not going to claim this one I might as well give up now. It’s odd how much it feels like a moral issue. Believe me, I’m well aware that no-one else cares about my rather paltry life list. But to add something to it without being sure; well, that would be cheating. So when I see one of these more difficult species, I really do fret about it, and usually I reluctantly don’t claim them. I tried to persuade myself I’d seen Common Redpoll last winter but just couldn’t quite swing it. 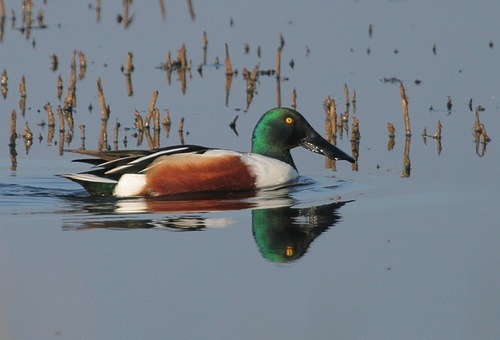 » Anas clypeata | Shoveler is © Muchaxo and used under a CC by-nc-nd licence.